A good week for stocks (SPY), up over 3%. Emerging markets (VWO) were up over 5%, but are still down 18% from spring highs and are on sale, so to speak, at February 2014 prices. On news that domestic crude oil production had fallen 120,000 barrels per day, about 15%, in September, an oil commodity ETF (USO) rose up 8% this week. On fears, and confirmations of fears, of an economic slowdown in much of the world, commodities have taken a beating in the past year, falling 50% or more. A broad basket of commodities (DBC) was up 4% this week but are still at ten year lows. An August 2010 Market Watch commentary recounted the evils of commodity ETFs as a place where the pros take the suckers’ money. Not for the casual investor. The Telegraph carried a brief summary of the latest IMF assessment of credit conditions around the world. There is an informative graphic of the four stages of the macro credit cycle and which countries are at what stage in the cycle. Some people say they dislike redistribution schemes on moral grounds. The government takes money from some people based on their ability and gives it to other people based on their need, a central tenet of Communism. In a 2014 paper IMF researchers have found that redistribution is a hallmark of developed economies. Why? Because advanced economies have the most income inequality. Why? Developed economies have greater income opportunity and opportunity breeds inequality. A sense of human decency prompts the voters in these developed countries to even the playing field a bit. In countries with greater equality, living standards and median income are lower. There is less income to redistribute. In the real world where the choices are higher income and redistribution vs an equality of poverty, I’ll take the more advanced economies. Since the beginning of this year the manufacturing component of the Purchasing Managers’ Index has continued to expand. The strong dollar has made U.S. products more expensive around the world and this has hurt domestic manufacturers. Growth has slowed from the strong expansion of the last half of 2013 and all of 2014. 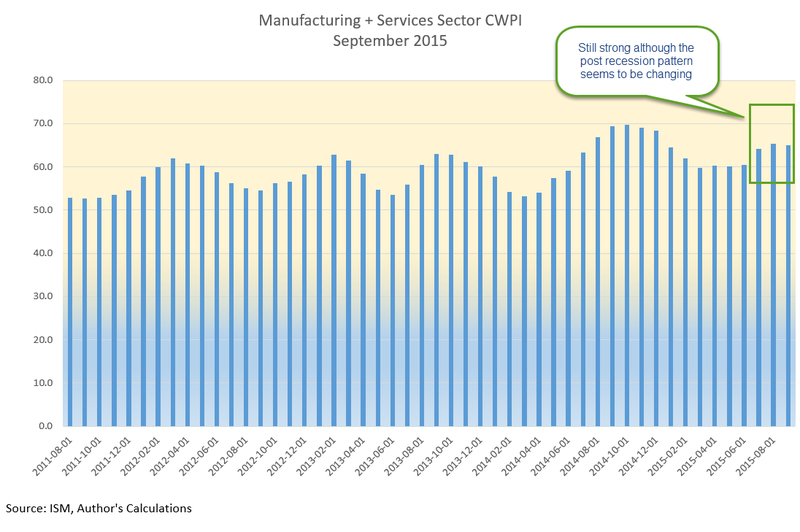 September’s survey of manufacturers is right at the edge between expansion and contraction. The CWPI weights the new orders and employment portions of each index more heavily. Using this methodology, the manufacturing side of the equation looks stronger than the headline index indicates. The services sector, most of the economy, is still enjoying robust growth and this strength elevates the combined CWPI. How much will the substandard growth in the rest of the world affect the U.S. economy? Industrial production in Germany declined last month. China’s growth is slowing. GDP growth in the Eurozone is barely positive. Emerging markets are struggling with capital outflows. Developed economies that are dependent on natural resources – Canada and Australia – are struggling. The GDP growth rate of both countries is very slightly negative. The U.S. is probably the one economic ray of hope. September’s lackluster labor report and the Fed’s decision to delay a rate increase has attracted capital back into the stock market. This past Monday, volatility in the market (VIX – 17) dropped down below its long term historical average of 20 but is a tiny bit above its 200 day average. I’d like to see another calm week before I was convinced that the underlying nervousness in the market has abated. Third quarter earnings season is here and estimates by Fact Set are for a 5% decline in earnings, the second consecutive quarter of declines since 2009.